Professor Beppe Karlsson och Dolly Kikon, postdoktor, berättar om forskningsprojektet ”The Indian Underbelly: Marginalisation, Migration and State Intervention in the Periphery” i det senaste avsnittet av AnthroTalking. Här kan du lyssna på hela avsnittet med Beppe Karlsson och Dolly Kikon. 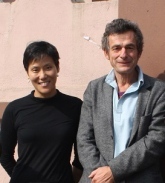 In this episode of AnthroTalking we interview Professor Beppe Karlsson and Dolly Kikon, postdoctoral research fellow, both positioned at the Department of Social Anthropology, Stockholm University, about their current research project The Indian Underbelly: Marginalisation, Migration and State Intervention in the Periphery. We talk about the new liberal state of India, its growing and changing economy and the relationship with the region of Northeast India, consisting of states such as Meghalaya and Nagaland. Simply depicted, the relationship is fractionated. Since independence, certain groups residing in the Northeast have opposed the idea of being part of the new nation-state in the making, accusing mainland India of draining their region of its natural resources. Beppe talks about his previous research in Meghalaya, and how this new project came to grow out of it. He also mentions agriculture, and what happens to it when people decide to migrate. Dolly, who recently came back from fieldwork in Nagaland, tells us about the migrants she met that sought employment at recruitment and grooming centres, along with five star hotels, and the ‘soft skills’ that are required of them.